Our Mechanical Fragility assay determines RBC ability to survive extremal stress. Red blood cell (RBC, erythrocyte) hemolysis is the release of hemoglobin (Hb) and other intracellular components from erythrocytes to the surrounding medium following rupture of the cell membrane. Such extracellular Hb has been associated with adverse reactions and impaired clinical outcomes in patients. Hemolysis can occur in vivo due to pathological conditions, transfusions or blood interaction with drugs or implanted devices. Haemolysis also occurs in vitro from storage of blood or RBC concentrates or from the interaction of a patient’s blood with ex vivo medical devices. In vitro testing of hemolysis is common in haemocompatibility testing for a safety assessment of drugs and devices and, thus, plays a critical role in their research and development. The hemolysis detection set-up comprises a light source, a sampling assembly, and a spectrophotometer. Illumination from an LED light source is delivered to the sample by a top fiber-optic cable. Light passing through the sample chamber is collected by a bottom fiber-optic cable and delivered to the spectrophotometer. A micromanipulator is manually operated to bring the upper (downward-facing) fiber-optic down to pinch the tube—causing it to be temporarily squeezed against a lower (upward-facing) fiber-optic to achieve a sample thickness suitable for the optical reading. The tubing constituting the flexible sample chamber was selected to have optical transparency as well as a balance of softness (for easy compression) and resilience (for recovery of original shape with minimal fatiguing). Alternatively, the sample chamber could be rigid with a pre-determined thickness—particularly if only hemolysis measurement alone were of interest. In the present method, the percentage of hemolysis present is determined by exploiting the ‘‘flattening’’ effect of absorbance spectra in the 390–460nm range (due to non-homogeneity of RBC samples, as previously described.[16,17]). For a sub-millimeter-thick intrinsically non-homogeneous RBC sample, spectrum- flattening effects would be very pronounced in the high-absorbing Soret region, without affecting lower absorbance in the VIS spectral range. Thus, the composite spectrum of partially haemolysed blood would in the near-UV range present an ‘‘apparent’’ Soret band combining a flattened spectrum for the Hb within cells and a non-flattened spectrum for the extracellular or cell-free Hb and in the VIS range present a spectrum for the combined non-flattened absorbance of the total Hb in the sample. The flattened Hb spectrum in the near-UV region at the Soret band can then be contrasted with the non-perturbed spectrum in the visible region. At different levels of hemolysis and, thus, different relative fractions of cell-free Hb, there would be changes to the ratio between the apparent Soret peak and the visible spectrum band’s maxima. Those would be proportional to the cell-free Hb fraction (see Figure 2), which, compared to total Hb concentration (measured independently or at 100% hemolysis), would determine the fraction of haemolysed cells. Changes in the absorption spectrum of an RBC sample upon hemolysis. RBC were diluted to 0.5g dL 1 haemoglobin ( 1.5% haematocrit) concentration with AS3 blood storage solution. Samples of leuko-reduced packed RBC in AS3 storage solution, typically 15–20g dl 1 Hb, was received from the University of Michigan Hospital Blood Bank and were used prior to expiration. Initial total hemoglobin concentration and, thus, hematocrit, was determined using the HemoCue 201 system, with successive changes due to progressive hemolysis estimated through iterative extrapolation based on previous hematocrit level (although high dilution reduces the impact of the correction). 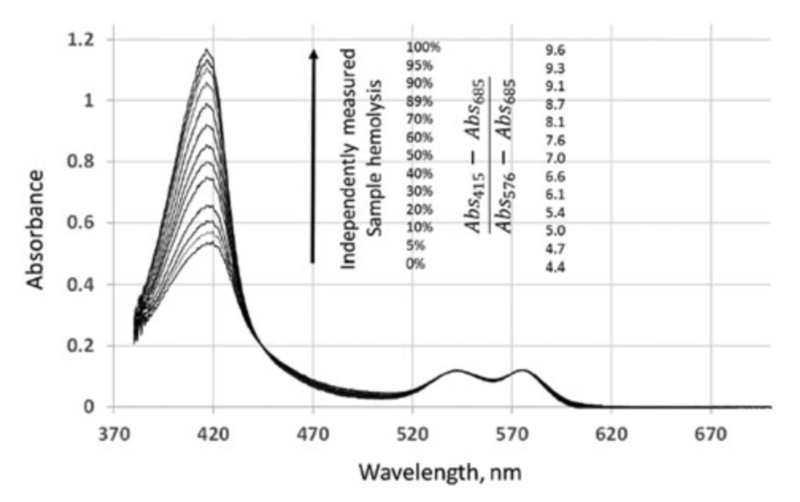 Presented are spectra (corresponding (A415–A685)/ (A576–A685) ratios) after the baseline correction with absorption at 685nm taken as zero and with absorbance at 576nm normalised to 0.12au based on extrapolation from two spectra— one slightly higher and another slightly lower than 0.12 au. thus, different relative fractions of cell-free Hb, there would be changes to the ratio between the apparent Soret peak and the visible spectrum band’s maxima. Those would be proportional to the cell-free Hb fraction (see Figure 2), which, compared to total Hb concentration (measured independently or at 100% hemolysis), would determine the fraction of haemolysed cells.